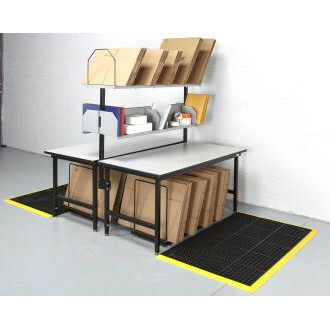 Double your packing with this double sided packing station and manifest console. Adjustable shelves to keep boxes, envelopes and packing tape at your finger tips. See Simple Adjustable Work Tables Click Here! • Duel top carton shelf hold 6 dividers for 5 different sized boxes or envelopes. • Double middle storage shelf is 64" x 9" x 9-1/2"H and perfect for packing supplies, envelopes and informational binders. • Lower large carton racks with 6 divider holds your largest cartons for packaging. Any and All of the shelves and Drawers and Brackets can be added or subtracted for any system to design the package area exactly as you need.